Enclosed housing slewing drive is composed of the fence type base, slewing bearing, enveloping worm and the completed spare parts. The Electronic motor and hydraulic motor can be all used as the power input source for slewing drives, which can make clockwise and counter clockwise rotation. Since the slewing bearing is the main part, this system has stronger tilting moment and axial load. This kind of slewing drive has more advantages than other reducers, such as its small volume, easy installation and maintenance. 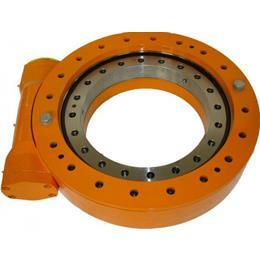 Enclosed housing slew drive is the most popular type slew drive in the world market. Its mainly apply to the relatively high condition for high requirement for dust-proof, rain-proof and anti-corrosion occasion, mainly for machinery and solar energy fields. Precision grade can be IP65. we can offer the enclosed housing slewing drive from 3inch to 25inch.